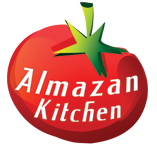 This time in the forest series with AlmazanKitchen you will see an interesting trick how to start a fire when all wood is wet. Our pet – Aski the Wolf will help us. Well… His fur. Of course we have something special for you. Great beef rib eye steak with sweet & hot melon garnish! Ignite the fur with magic of your hands… If you can’t just use the lighter or something else. Put the fur beneath the campfire. Toss handful of walnuts into the pan. Transfer walnuts from the pan into the grinder. Remove the top from the melon then cut the melon in half. Scoop out… or hand out the seeds. Cut both halves into major slices. Make small cuts on the slices. But do not cut off. Load 800g beef rib eye steak into the grill cage. Grill for 5 min. flip halfway and salt once more. Leave to rest for 3 min. Cover melon slices with 1 tbsp. of honey. Add 1 tsp. ground chili same way.